It's not often that we get to blame a novelist for sparking a cake obsession, but at the moment, the fault lies squarely with Lawrence Norfolk, author of John Saturnall's Feast. Mentioned in our monthly reading round-up, the book is set in the kitchens of a seventeenth-century manor house, and since finishing it, I've been haunted by phrases like 'Madeira sugar', 'Quodling apples', 'dates and sweet cream'. So with a bit of digging, I came across a very old recipe for baked apple pudding, from a Danish book of folk-tales. 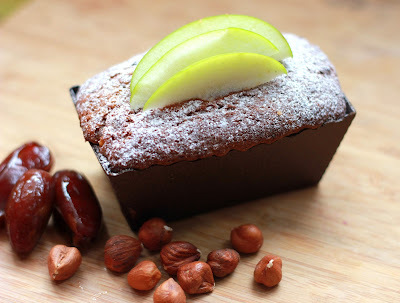 It's a fruit-heavy, and definitely more pudding than cake; I adapted it by adding dates for natural sweetness and hazelnuts for a woodland feel. The vanilla bean mingles beautifully with the flavour of cooked apples, so if you can get your hands on a real vanilla pod, all the better. If you're not a hazelnut fan (or don't have any in the cupboard) walnuts would work fine. These mini-loaf cases are adorable, minimum fuss and very efficient if you have to transport the cakes around. They're widely available in most larger supermarkets or cook shops, but if you can't find any, then a 450g loaf tin will do. Preheat the oven to 180C/350F/gas mark 4. Lightly grease the mini loaf cases, or grease and line the larger loaf tin, if using. Place the chopped apples in a small saucepan with the sugar and dash of juice or water. Using the point of a sharp knife, split the vanilla pod and scrape the seeds into the apple mix, stirring to combine. Cook gently over a low heat for around 10 minutes, or until the apples are just turning gooey. Set aside. Gently toast the chopped hazelnuts in a dry saucepan or a tray in the oven for a minute or two. Don't take your eye off them! Set aside. Combine all of the cake ingredients, including the hazelnuts, in a large mixing bowl. The mixture will seem dry at first, but keep stirring and it should become moist. Fill the loaf cases halfway with the cake mixture, then add a spoonful of apples, spreading them out evenly. Cover the apples with more cake mixture, until the cases are 2/3 full. Bake for 25-30 minutes, until the cakes are risen and a skewer comes out almost clean. (If using the larger loaf tin, you may need to increase the cooking time by 10-15 minutes). Decorate with a dusting of icing sugar and slices of fresh apple. In an ideal world, these should be served warm, with a pot of thick, whipped cream or smothered with real home-made custard.